This post of Wooster’s Fossil of the Week marks five years of this feature. If you’re counting, that is 260 entries, with never a week missed. To celebrate, I’m returning to the very first fossil in the series, a beautiful encrusting tabulate coral. The original entry is below, with some updates and added links. This week’s fossil was collected by Brian Bade of Sullivan, Ohio, and donated to Wooster as part of my hederelloid project. It is a beautiful specimen of the tabulate coral Aulopora encrusting a brachiopod valve from the Silica Shale (Middle Devonian — about 390 million years old) of northwestern Ohio. [Update: I now know the species is A. microbuccinata Watkins, 1959.] Auloporid corals are characterized by an encrusting habit, a bifurcating growth pattern, and horn-shaped corallites (individual skeletal containers for the polyps). What is especially nice about this specimen is that we are looking at a well preserved colony origin. The corallite marked with the yellow “P” is the protocorallite — the first corallite from which all the others are derived. You can see that two corallites bud out from the protocorallite 180° from each other. These two corallites in turn each bud two corallites, but at about 160°. This pattern continues as the colony develops (a process called astogeny). The angles of budding begin to vary depending on local obstacles; they never again go below 160°. The polyps inside the corallites are presumed to have been like other colonial coral polyps. Each would have had tentacles surrounding a central opening, and all were connecting by soft tissue within the skeleton. They likely fed on zooplankton in the surrounding seawater. This type of coral went extinct in the Permian, roughly 260 million years ago. Again, we thank our amateur geologist friends for such useful donations to the research and educational collections in the Geology Department at Wooster. Aulopora was first described in 1826 by Georg August Goldfuss (1782-1848), a German paleontologist and zoologist. (Goldfuß is the proper spelling, if I can use that fancy Germanic letter.) 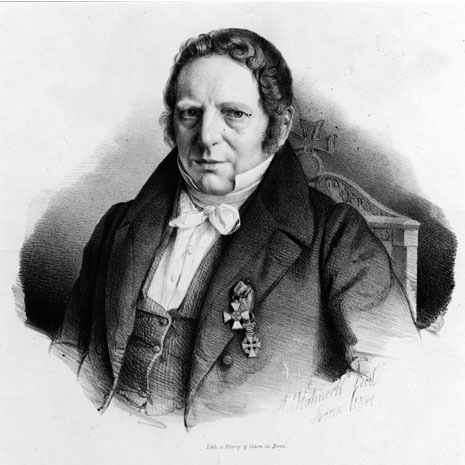 He earned a PhD from Erlangen in 1804 and later in 1818 assumed a position teaching zoology at the University of Bonn. With Count Georg zu Münster, he wrote Petrefacta Germaniae, an ambitious attempt to catalog all the invertebrate fossils of Germany (but only got through some of the mollusks). The 1841 portrait above is by Adolf Hohneck (1812-1879). Fenton, M.A. 1937. Species of Aulopora from the Traverse and Hamilton Groups. American Midland Naturalist 18: 115-119. Fenton, M.A. and Fenton, C.L. 1937. Aulopora: a form-genus of tabulate corals and bryozoans. American Midland Naturalist 18: 109-115. Goldfuß, G.A. 1826-1844. Petrefacta Germaniae. Tam ea, quae in museo universitatis Regia Borussicae Fridericiae Wilhelmiae Rhenanae servantur, quam alia quaecunque in museis Hoeninghusiano Muensteriano aliisque extant, iconibus et descriptionibus illustrata = Abbildungen und Beschreibungen der Petrefacten Deutschlands und der angränzenden Länder, unter Mitwirkung von Georg Graf zu Münster, Düsseldorf. Scrutton, C.T. 1990. Ontogeny and astogeny in Aulopora and its significance, illustrated by a new non‐encrusting species from the Devonian of southwest England. Lethaia 23: 61-75. Watkins, J.L. 1959. Middle Devonian auloporid corals from the Traverse Group of Michigan. Journal of Paleontology 33: 793-808. Congratulations Mark on this enduring, entertaining and consistently informative series of blogs. Helm, C. 1999. Astogenese von Aulopora cf. enodis Klaamann 1966 (Visby-Mergel, Silur von Gotland). Paläontologische Zeitschrift 73 (3/4): 241–246. 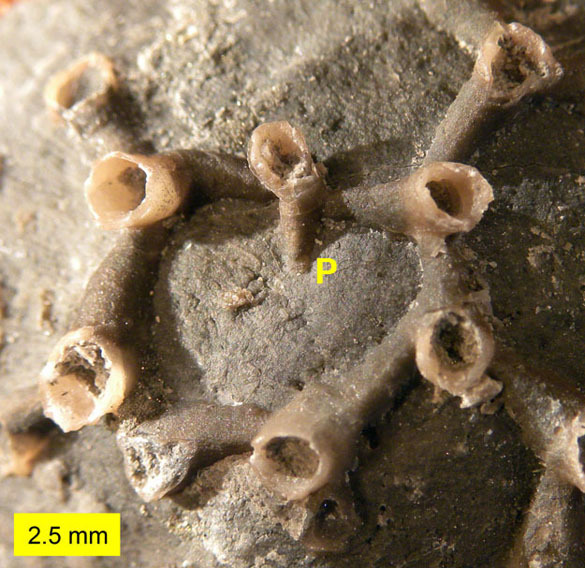 This shows how similar the branching pattern in this coral is to that of some encrusting bryozoans. Thank you very much for the kind words, Paul. I shall add the useful reference!